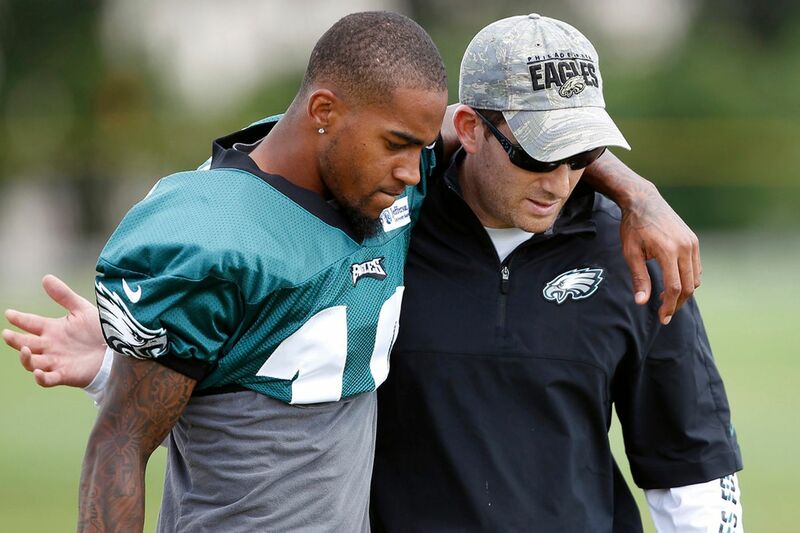 DeSean Jackson, left, with his arm around general manager Howie Roseman at training camp in 2012. Good morning, and happy new (league) year. The NFL calendar turns at 4 this afternoon, when signings can become official and trades can be consummated. At that point, DeSean Jackson will join the Eagles and Nick Foles will officially leave. This is a Wednesday edition of the Early Birds newsletter, and there will be a special Friday edition this week, too. I want to know what you think, what we should add, and what you want to read, so send me feedback by email or on Twitter @ZBerm. Thank you for reading. NFL free agency: Which players will the Eagles target next? Offensive tackle Jason Peters, right, watching as the Eagles defense takes the field against the Cowboys in December. The Eagles agreed to sign defensive tackle Malik Jackson and trade for wide receiver DeSean Jackson, and brought back left tackle Jason Peters on a new deal. Quarterback Nick Foles is heading to Jacksonville, and linebacker Jordan Hicks is signing with Arizona. The Eagles did not pick up the option for offensive lineman Stefen Wisniewski, so he’s free to leave. They decided to use a second-round restricted free-agent tender on backup QB Nate Sudfeld, almost assuring he will stay. That’s been the extent of definitive Eagles activity so far. Cornerback Ronald Darby and wide receiver Golden Tate are the top two free agents on the Eagles set to hit the market. Also, pay attention to receiver Nelson Agholor, whose $9.34 million fifth-year option becomes guaranteed if he’s on the roster at 4 p.m. It sounds as if the Eagles are planning on keeping Agholor. The Eagles hit two of their big needs by addressing defensive tackle and a deep threat at wide receiver. But there’s more work for Howie Roseman and Co. to do. Running back must be a big priority for the Eagles. The market might pick up now that the biggest fish, Le’Veon Bell, has reached a deal with the Jets (more on that below). The top available running back is Atlanta’s Tevin Coleman, who would be a good fit for the Eagles, although likely an expensive one. Coleman, 25, is an all-purpose running back with a career average of 4.4 yards per carry while sharing a backfield in Atlanta. Jacksonville’s T.J. Yeldon could be an option; the former second-round pick underachieved with the Jaguars and could benefit from a change of scenery. The Eagles might explore the trade market, where Cleveland’s Duke Johnson would be an appealing option. They could even re-sign Jay Ajayi, but there’s risk there with Ajayi coming off a torn ACL. The Eagles need to replace Hicks at linebacker. The top internal options are Kamu Grugier-Hill and Nate Gerry, and it’s not out of the question that the Eagles will turn to them and simply add depth at the position. If they’re willing to spend, Seattle’s K.J. Wright is still on the market. The New York Jets could trade 2016 first-round pick Darron Lee after signing C.J. Mosley. There aren’t other starting spots available on the Eagles, but depth is needed in some key spots. Look for the Eagles to explore the veteran backup-quarterback market so Sudfeld has competition. Tyrod Taylor is the top option at this point, but he could find an opportunity that offers a chance to start. The Eagles could use another defensive end and a third safety. They can always wait for the draft, but you never know how the draft board will fall. It’s been a busy few days in the NFL outside of Philadelphia. Let’s start in New York, where both teams made headlines the past few days. The Giants agreed to trade Odell Beckham Jr. to the Cleveland Browns for two draft picks and safety Jabril Peppers, according to reports. This move has serious implications for the Eagles considering they will no longer need see Beckham twice a year. It could also signal a rebuilding phase for the division rivals. Before free agency this weekend, Pittsburgh agreed to trade star wide receiver Antonio Brown to the Oakland Raiders, who also reached a deal with left tackle Trent Brown and defensive back LaMarcus Joyner. The Detroit Lions made a splash by signing defensive end Trey Flowers away from New England. The Packers were active Tuesday, improving their defense by adding pass rushers Za’Darius Smith and Preston Smith, as well as safety Adrian Amos. None of those moves can become official until 4 p.m., when a whole lot more will take place. Giants wide receiver Odell Beckham catching a touchdown pass in front of Eagles cornerback Jalen Mills in September 2017. Paul Domowitch catches you up on Day 2 of the tampering period for the Eagles. What do the beat writers think of the additions of DeSean Jackson and Malik Jackson? Jason Peters is staying for his 11th season with the Eagles. Jeff McLane looks at Howie Roseman’s decision to bring back DeSean Jackson. Mike Sielski defends the move. Domo explains why interior pressure from Malik Jackson is so important. Ed Barkowitz fills you in on what you need to know about Malik Jackson. Les Bowen writes about Nick Foles’ departure. After losing Hicks, is there a LB out there you feel fits this team the best? With Mathieu going to the Chiefs, Berry might be done there, maybe a good veteran backup given his injury history? Zach what does the Eagles linebacker situation look like in 19? Little scary right now isn't it? There were a few linebacker-related questions. My sense is the team expected Jordan Hicks to leave in free agency. I think Hicks is a good player whom the Eagles will miss, although his injury history cannot be ignored. The Eagles have not prioritized that position, so I didn’t see them making that type of cap investment in Hicks. They have Nigel Bradham, who played well as the three-down linebacker and the defensive signal-caller in Hicks’ place during Hicks’ injuries the past two years. The Eagles are not in their base defense often, and they’ve played more dime during the past two years with only one linebacker on the field, so Bradham will be the player in the spotlight. The Eagles could turn to Kamu Grugier-Hill or Nate Gerry in the nickel and use both of them in base; they’ve invested in the development of both players. But the Eagles need to be honest about whether either or both can take their game to another level. There have been years when the depth at linebacker appeared a major problem in the spring and summer, it wasn’t addressed, and then it became an issue during the season. I’d be intrigued by trading for Darron Lee, as mentioned above. He’s a speedy linebacker who can cover. The Eagles have taken a chance on former high draft picks before, such as Chance Warmack in 2016. However, I’d prioritize third safety more than linebacker. I think the Eagles are best in a heavy nickel or dime with three safeties on the field. Malcolm Jenkins’ versatility allows him to play up in the box almost as an extra linebacker. The Eagles could use Avonte Maddox as the third safety, especially because they have cornerback depth. This could be the plan, too, if they re-sign Ronald Darby. But to the above question, I don’t see Kansas City moving on from Eric Berry. I expect the Chiefs to pair Berry and Tyrann Mathieu.